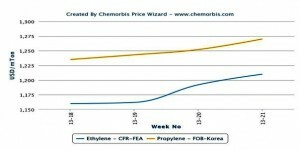 In Asia, olefin markets gained ground week over week amidst a steady to firmer upstream chain when compared to the beginning of May as per the pricing service of Chemorbis. Increased buying interest drove olefin offers higher during the period, according to some market players in the region, while supply was said to be not that ample owing to a scheduled shutdown in Japan. Looking at the upstream chain, crude oil futures on the NYMEX for June deliveries recorded some drops earlier last week before closing the week with gains during the last two working days. They were almost unchanged when compared to the second week of May, but still represented nearly an increase of $5/barrel with respect to the beginning of the month. Spot naphtha values recorded a small decrease on CFR Japan basis week over week to stand a bit above early May levels. Olefin availability was said to be not ample as Japanese Mitsubishi Chemical started a scheduled maintenance at its Mizushima cracker at the end of last week. The company will reportedly keep its cracker offline for almost two months before restarting it at the beginning of July. The cracker produces 495,000 tons/year ethylene and 320,000 tons/year propylene under normal circumstances. Fushun Petrochemical already shut its 800,000 tons/year ethylene unit located in Liaoning, China in the second week of May. The company is currently implementing a 45 day turnaround at the unit as planned. Mitsui Chemical plans to shut its Chiba cracker in Japan by late June to early August. The 600,000 tons/year cracker will be offline for around one and half months. News of the shutdown boosted buying interest for June olefins cargoes among end users, sources in the region commented. Moreover, tight vessel spaces reportedly encouraged traders to remain firm on their pricing policy, while comparatively limited prices were available in the market. 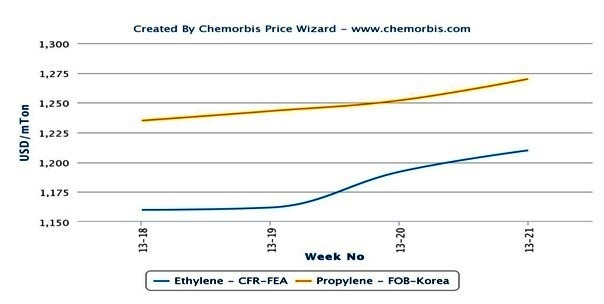 According to ChemOrbis, spot ethylene prices gained $20/ton on CFR Northeast Asia basis week over week, which brought the cumulative increase amount to $50/ton from the beginning of May. Spot propylene offers rose by $10/ton on FOB South Korea basis while they indicated a $30/ton increase from early this month.